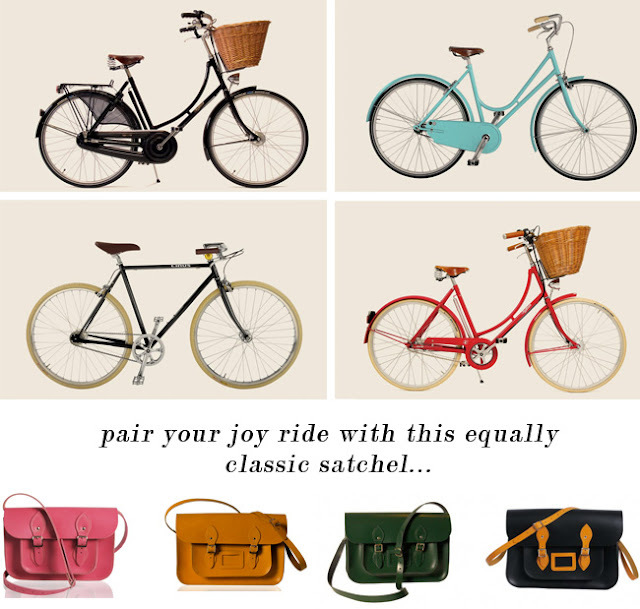 Just discovered this super rad bike shop, Adeline Adeline, who also just so happened to design the newest bicycle for Kate Spade's lifestyle section. And these satchel bags just complete the timeless look at the Original Satchel Co...these 2 pieces alone will get you featured in the Sartorialist in heartbeat, guaranteed! Now go on and get your nostalgia on! Look super cute and fun! Love it! Love that pink bag! Yeah I had a bike like this... It was powder blue. It looked a little like the second picture. And it got stolen the second day I had it. Oh well, life goes on.